To order a printed copy of the Fred Holidays 2019 brochure, simply click the Request button below. You can download the Fred Holidays 2019 Brochure instantly as a digital iBrochure [?]. Fred Holidays invites you to enjoy a tailor-made getaway like no other, request the Holiday Inspiration brochure today for an incredible collection of holiday ideas to get you dreaming. Inside you'll find a tempting range of destinations and suggestions on thrilling things to see and do. Head to Germany and sample the lively atmosphere in the Hofbräuhaus, one of Munich's oldest breweries. If you prefer quieter surroundings then visit Basel and take in the historic landmarks such as the astonishing Romanesque Cathedral. Fred Holidays pride themselves on providing a bespoke experience, so handpick the perfect travel arrangements, accommodation and activities that suit you. 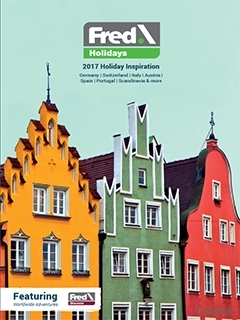 Order the Fred Holidays - 2019 Holiday Inspiration brochure today for ideas on the trip of your lifetime! Fred Holidays 2019 Brochure Gillian J. said: Arrived very quicely, good range of holidays, would like to see more information about flights from local airports in the brochure. Fred Holidays 2019 Brochure Janet B. said: food for thought! Fred Holidays 2019 Brochure David K. said: Great choice of holidays at fair prices. By pressing the Request Printed Brochure button you give consent to Fred Holidays 2019 (and their Data Processors for the specific purpose of delivering your literature) to send you their Brochure .